Electrical Box Furnace Delivered For Canadian Government Projects - L&L Special Furnace Co, Inc.
L&L Special Furnace Co., Inc. has delivered an intermediate-sized front-loading box furnace that will be used by the Canadian Government Forestry Division. The furnace was sold by CCT Enterprises, which represents the company in various sales. 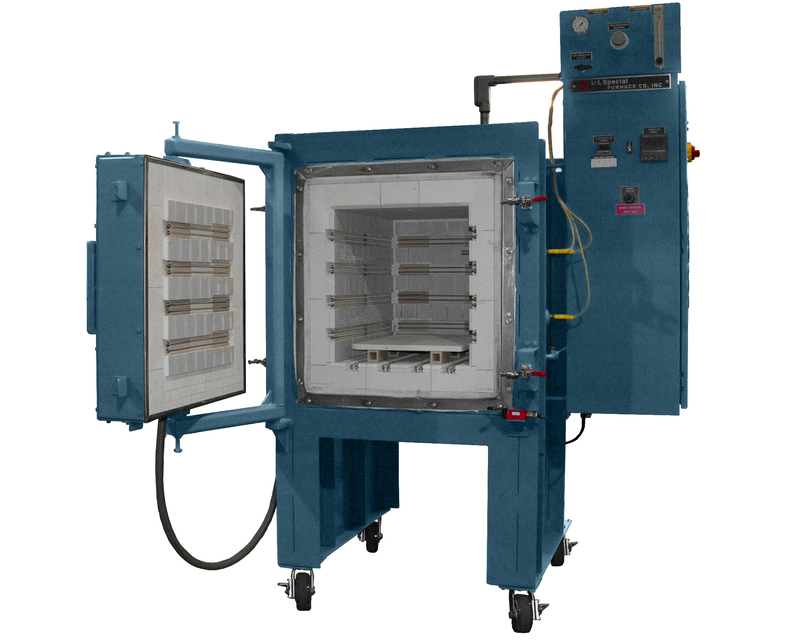 With a working zone of 16” wide by 16” high by 20” deep, the furnace is equipped with an atmosphere-sealed case for use with inert gas to displace oxygen and minimize surface de-carb. It is purged with inert gas prior to loading and the parts are then heated under a controlled atmosphere. There is a 1” NPT survey port located on the right side of the furnace employed for calibration and uniformity surveys. Heating is supplied by Kanthal APM elements located on the sides, bottom, back and door. These elements are wire wound coils with a heavy cross-section that allows for higher soak temperatures for longer periods of time. The control system includes a Eurotherm EPC3004 multiple program control and overtemperature protection. The NEMA 12 control panel includes all necessary fusing along with internal switches and solid-state relay power controls divided into two zones for temperature gradient balancing. The furnace is manufactured in accordance with Canadian Electrical Standards. It is mounted on casters, has a 50-foot cord for portability, and can be moved to various departments within the plant for use. All L&L furnaces can be configured with various options and be specifically tailored to meet customers’ thermal needs. The company also offers furnaces equipped with pyrometry packages to meet ASM2750E and soon-to-be-certified MedaCred guidelines. Options include a variety of control and recorder configurations. A three-day, all-inclusive startup service is available within the continental US and Canada. International startup and training service is available by factory quote. If precise temperature control and uniformity is a key to your process, then L&L’s XLE series is a great choice. Please be sure to visit our new website at llfurnace.com.